More than 350 working artists in all mediums fill the Eureka Springs Arts sceen with a cornucopia of artistic variety. 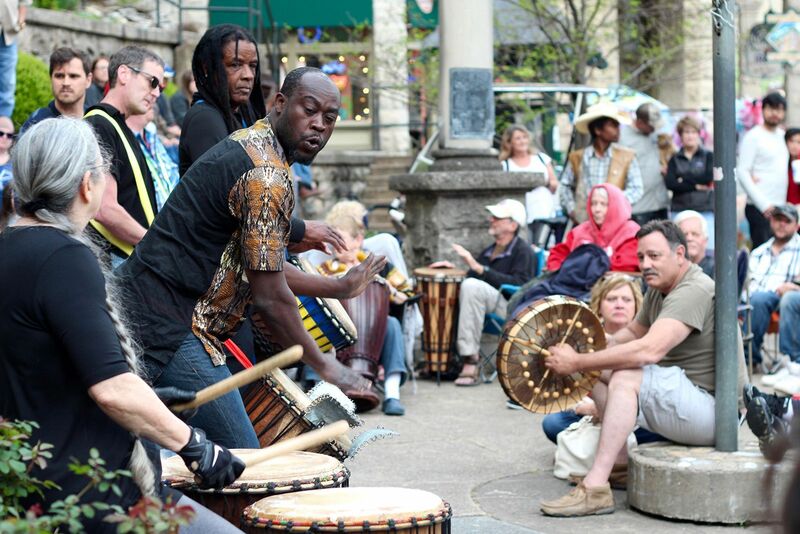 Our 31st annual May Festival of the Arts is packed with one-of-a-kind art exhibits, demonstrations, performances, culinary arts, free music in the park, and the wildest street party thrown by artists – The White Street Walk. May 3, 8 to 11 p.m.
Steve Earle performs with his longstanding band The Dukes will take the stage at The Aud on the opening weekend of May Festival of the Arts. Junior Brown opens with his signature double-nexk electric guitar and steel guitar, which blends his country/rock & roll sound and compliments his crossover artist style. May 3, 8:30 to 10:30 p.m. Opening night for The Great Passion Play, which runs each weekend May through October 2019. Tickets and a complete schedule of times and performances, as well as other planned activities on the Passion Play grounds is available online. The annual parade rolls through downtown Eureka Springs at 2 p.m. This year, the theme of the parade is costumes. The public is invited to wear any costume to the parade; nothing is off limits. If you're having trouble coming up with a costume, come to Basin Spring Park between 10 a.m. and 1 p.m. to get some help. The premiere screening of Hollywood.com will take place at The Auditorium. May 4, 5 to 7 p.m.
Mattson 2 will perform free live music at Basin Spring Park. The band is amde of identical twins, Jared and Jonathan Mattson. Tom Easton will perform as part of the Eureka House Concert series at the Eureka Unitarian Universalist Fellowship at 17 Elk St.
May 5, 11 a.m. to 5 p.m. Celebrate at Cinco De Mayo at Basin Spring Park. May 10, 8 to 11 p.m.
Summer concert series, presented by Eureka Springs City Auditorium and EZOMB LLC, features Paper Anthem and Rocket Coma. May 11, 6 to 9 p.m.
Eureka Springs School of the Arts will have a public reception starting at 4 p.m. where you can tour the campus and see ongoing projects. Stop by Basin Spring Park for an inside look at the art of Eureka Springs. Local artist Gina Gallina will be in the park on Saturday to teach the public how to crochet flowers and leis. John Two-Hawks will perform his annual Mother's Day show at The Auditorium. Mothers get in free. The Chalk Festival returns to Eureka Springs for a second year, featuring incredible chalk art created by professional artists. May 17, 4 to 10 p.m. Walk the Historic Loop down White Street and discover artists in studio. Jewelry, pottery, painting and beyond will be on display. The once-a-year ever is only found in Eureka Springs. The 2019 Eureka Springs Enduro is a weekend trail bikers dream of. A combination of Passion Play ground, DH trails at Lake Leatherwood and some new routes made just for the Enduro! Not to mention the urban stage in downtown Eureka Springs. May 18, 5 to 7 p.m. Enjoy Jazz in Basin Spring Park with music by Arthur Duncan at 2:30 p.m. and Grady Nichols at 5:30 p.m.
May 19, 12 to 5 p.m. Celebrate the written word at Crescent Hotel Garden during the 14th Annual Books in Bloom. Visiting authord include Chris Bohaljian, Wiley Cash, and "Pete the Cat" creater James Dean. Author presentations and free dialog sessions abound to educate aspiring readers on the practices of authors successful in their genres. Books in Bloom is presented by the Carroll and Madison Public Library Foundation. Six glorious days of painting out-of-doors in historic Eureka Springs is more than enough inspiration to ame a masterpiece. Event activities include Paint Out, Quick-Draw Event, Juried Competition, Prizes, Public Art Exhibit and Art Sale. Events held at the Eureka Springs Community Center, 44 Kingshighway. CMA Arkansas presents the kick of with bike night at Ozark Fish & Chicken. Guided rides, praise and worship services, youth events and games. May 26, 5:30 to 9 p.m.
Opera in the Ozarks offers a cabaret performance at Grand Taverne for a night of good music and delicious food. May 25, 5 to 7 p.m.
Get your mustang fix and then some at the 2019 Eureka Springs Mustang Show. Mustangs of all model and year, custom and factor, you'll see it all. All Ford-Lincoln or Mercury products are also wlecome to participate.